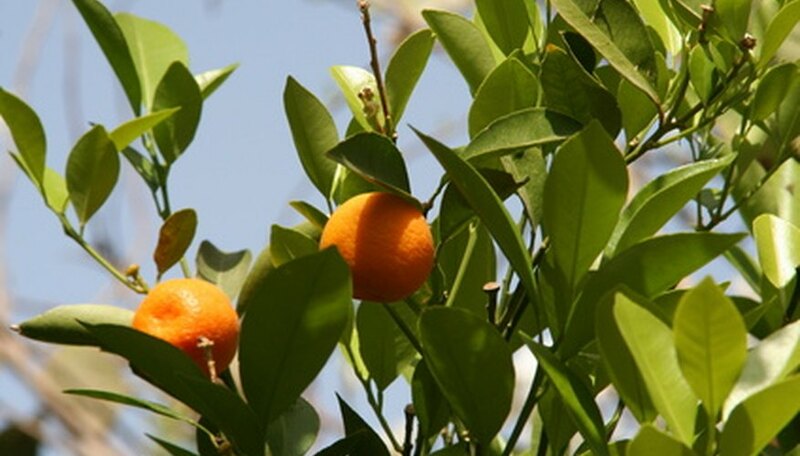 Florida orange trees provide a good opportunity for a nutritious snack from December through April, depending on the variety, but they can also encounter a number of different problems. Weather, disease and pests can all threaten not only that year's crop, but also the tree itself. Therefore, making sure the tree is in an appropriate location and getting the care it needs is essential to optimum yield and maximum life. Orange trees grow best in zones 9 to 11, though growers may need to take some precautions against freezing during especially cold winters. This means orange trees can grow south of a line from approximately Jacksonville on the Atlantic Coast to just south of Gainesville, and then over to Cedar Key on the Gulf of Mexico. Commercial growers must remain well south of this northern edge. Trees should be grown in full sunlight. The best time to plant oranges is in the spring, although you could plant nearly any time of the year when it has enough time to establish itself before a possible freeze. The soil pH should be between 5.5 and 7.5 for the best results. Remember to use a hose to get get all air pockets out and water frequently during the first few months after planting. One of the easiest ways to protect against a frost or freeze is to plant the orange tree near a home's south-facing wall, which provides radiant heat from the home and more direct sun rays during the winter. If a freeze is imminent, cover the tree if it is small enough. If it is a larger tree, water the ground thoroughly before the freeze event and sprinkle the tree with water to help protect it from the sub-freezing air. While the state receives enough water to keep most citrus alive under normal conditions, the sandy soil means it does not retain much water, so during dry times of the year, supplemental watering may be needed. Watering should be done approximately twice a week slowly to allow for maximum penetration. Drip systems can also be used. Anthracnose, brown rot, citrus scab and citrus canker are just a few of the common diseases affecting Florida orange trees. Citrus canker is considered one of the worst because it can devastate the entire citrus industry. Therefore, trees that have contracted the highly dangerous bacterium or could have been exposed to it, are generally destroyed by burning. Fungicides are often effective for many different types of fungal infections. Make sure the tree is in soil that is well drained to prevent recurrences. Insects can devastate entire crops as well, including the Mediterranean fruit fly. Larvae are laid inside the fruit and eat away at it, turning it into a gelatin-like mass. Spraying aggressively can get rid of the fruit fly. Pesticides specifically designed for fruit trees can help eliminate mites and other insect pests that feed on leaves, fruit and wood.